Airside charging points at Heathrow airport have been installed using a plinth system to reduce infrastructure works. eVolt has supplied its 200th electric vehicle (EV) Rapid Charging unit to Heathrow Airport after the company received a contract to provide the UK’s largest airport with 18 of its units in phase one. The significant milestone was achieved as a result of the hard work of Freemantle Electrical – the selected EV charger and infrastructure installer for the initial phase of works. 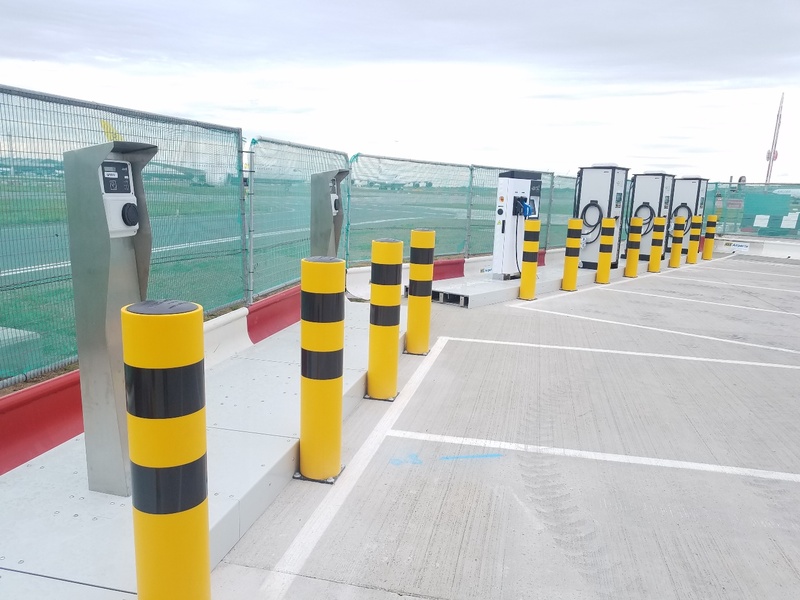 The chargers were installed using a specific newly designed EVCI-Go modular plinth system developed by Freemantle that allows wiring through the plinth system, which avoids any major civils works and speeds up the installation process. The Airport selected eVolt as its supplier of EV charge points following a competitive tender where multiple suppliers were reviewed. The new Rapid charging units have been installed at eight of the airport’s airside locations including the Airside Operations Facility (AOF). They will be used by Heathrow Airport’s growing fleet of EVs run by Heathrow Airport Limited and its tenants assisting in everyday operations. Three Compact Rapid charging points, that can simultaneously charge two EVs to 80% battery capacity in 30 minutes at 50kW DC and 43kW AC, have been installed, taking the number of eVolt Rapid charging units installed in the UK to over 200. A Semi-Rapid Raption 22kW Triple charging unit that charges an EV to 80% in one hour has also been installed. This is ideal for fast top-up charges and utilises the latest modular power technology for enhanced reliability and performance. The contract also includes the supply of eVolt 7kW and 22kW AC Wall mount charging units, which typically take up to four hours to charge an EV, depending on battery size. It is expected that these will be used to provide charging to ‘off-duty’ EVs, ensuring that when a shift starts the vehicles are able to make use of a full charge.